Why should we all unite in making each other's lives a little hell of trivial tortures? — Jean Wade, the idealistic new teacher at Malyn Park School. What else could you expect? Look at us. A small group of women all cooped up together with no release from each other save in the privacy of our bedrooms. Women brought together not by choice, not by liking, but by the necessity of earning our living.No outside interests, no outside friends, nothing to talk about but the pettifogging details of the school and all that therein is. — Miss Strong, who after years in this environment has long lost the younger woman's more benign view of teaching and teacher solidarity. With Women Without Men by Irish playwright Hazel Ellis (1909-1986), the Mint Theater Company's producing artistic director Jonathan Bank has once again fulfilled his archeological mission of rescuing little known and rarely produced plays from crumbling away in a theatrical dust bin. Since this is also the Mint's first play in a venue other than its long-time home on 43rd Street, Mr Bank also deserves stand-up applause for two other achievements: For the way he's reconfigured his temporary current home to provide the entire audience with perfect sight lines. . . and for his strong show of diversity in action by backing large all-female cast with a female director and an all-female crafts team. Okay, so the props and hair design are handled by two men, but except for Phyllicia Lloyd's all-female Shakespeare productions, how much completely women dominated work have you seen on or Off-Broadway. Even when Women Without Men had its only production at the Gate Theater 78 years ago, the director was a man. This was also the case for Lillian Hellman's very different girls' school play, The Children's Hour at the Gate and in a fairly recent London production. Of course, no matter what the cast's gender, any production's success depends on what the actors do with the roles given them. Fortunately, each resident of the cloistered all-girls boarding school in suburban Dublin, circa 1937 in which Hazel Ellis set her workplace drama, does very well indeed to individualize the personalities of their characters. That cast of characters includes not only a group of teachers but three of the students, the tough principal and the school matron. 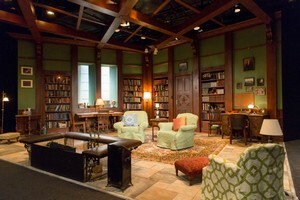 Vicki Davis's teacher's sitting room (tagged "the tyrant's den" by the students) in which the play's six scenes unfold is cleverly angled, which eliminates the far right seating section but gives the audience at the other side a straight up a view of the stage. With its book-lined walls, this single set seems like a comfortable and pleasantly communal retreat — but not for long. As we quickly learn, the room's chief attraction is the large fireplace that provides more warmth than the teachers' spartan bedrooms. Furthermore, the warmth generated from that fireplace is not paralleled by the kind of warmth associated with time spent among congenial companions. Instead there's an overarching sense that what these women have in common is disappointment with not just their work and working conditions but with their lives generally. What brought them together is the necessity of earning a living in a world of limited opportunities. Their meager salaries, demanding work schedules and less than ideal accommodations, have done little to foster extra-curricular interests or nurture supportive friendships. On the contrary, their humdrum existence has made the faculty "retreat" into a seedbed for spiteful, mean spirited small talk, as well as petty and major conflicts. All this venom erupts with the arrival of Jean Wade (Emily Walton), a new teacher fresh out of college and full of enthusiasm. Jean immediately sends Ruby Ridgeway (Kate Middleton) into Green Monster mode. Ruby is still young and attractive (but at 30 s not THAT young). She not only resents Jean's being younger and very pretty but that she's been given a room of her own, while she is still sharing hers. Jean doesn't win over Ruby or, for that matter, any of the school's other worker bees, when she turns out to be an excellent and popular teacher. Jean's strongest supporter, and the play's smartest and most likeable character, is Marjorie Strong (Mary Bacon giving a strong, performance to match her character's name and personality). She sees in Jean the bright and hopeful young woman she was when she arrived at Malyn Park Private School twenty years ago. The way Jean evokes memories of her own failed possibilities, prompts the older woman to now and then abandon her usually acerbic loner stance to protect and counsel Jean and save her from getting trapped into a similar dead-end life. When the girls in one of her classes send Jean flowers her advice is: "the more unpopular you make yourself out with the girls, the more the girls' teachers will like you." The playwright has also given some of her best dialogue to Marjorie Strong. When Jean becomes disgusted with all the bickering but explains her hesitancy to take Marjorie's advice to marry her boyfriend with "women married to rotters of husbands" as being in a still more tragic position" Marjorie' wryly counters "Tragedy is at least interesting. It is better than sheer dreariness." The woman who seems most willing to be Jean's friend but ends up being her worst enemy, is also the play's most tragic character is Miss Conner (Kelly Overby, the youthful 42-year-old actress managing to be remarkably convincing as a much older woman). Miss Conner is especially pitiful because of her extremely difficult financial situation, something many modern women of a certain age and single moms working several low paying jobs can identify with. But even more tragic is that Miss Conner's snobbish superiority about understanding true beauty and the book she's been writing on this subject for twenty years smack of delusional pipe dreamers of Eugene O'Neill's The Ice Man Cometh. In addition to getting solid performances out of her actors, director Jenn Thompson has created a nice touch by using the students' songs for the between scenes pauses. Martha Hally's costumes aren't just true to the period but further define the personalities of their wearers. The figure flattering maroon suit and matching pumps in which Emily Walton's Jean makes her first appearance underscore that unlike Miss Strong and Miss Conner's clunky shoes and "spinsterish" costumes, here's a woman still anticipating a life filled with brightness and joy. While Hazel Ellis did manage to escape the dreary lives depicted in Women Without Men, as an actress and eventually as playwright with the Gate Theater, but like so many of her contemporaries her career was short-circuited by two marriages — both true to Marjorie Strong's observation about even tragically bad marriages being better than sheer dreariness." Despite Ms. Thompson's best effort this dour group portrait does tend to have slow spots that may have some audience members wishing some of the chatter of characters like Mademoiselle Vernier could have been trimmed. But paring these forgotten plays down to a breezier, more modern length isn't the Mint way. Besides, aren't these slow and tedious moments a way for us to get a real feel for the many more tedious moments these women had to endure. 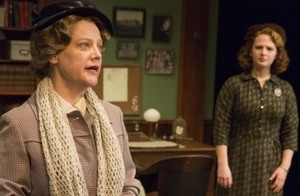 Hazel Ellis and the characters in her play would be thrilled at the options now open to women." But the glass ceiling is still not without cracks. And so, the Mint's production of Women Without Men is a celebration of the progress that's been made — and the rarity of an all-female team like this is a timely reminder that gender inequalities in all walks of life still exist. From 1/30/16/ opening 2/25/16; closing 3/26/16.